Well done and thank you to the 30+ volunteers who made our Community Fete such a success on Sunday. Well over 500 people came to enjoy the sparkling day. Steyne Park was at its festive best, with a massive jumping castle, an array of favourite carnival games, flapping sails advertising laser sailboat rides on the lawn, remote controlled sailboats in the harbour, fairy floss and sausages to enjoy, and power boat rides from the front deck of the club. We served over 600 sausages and made over $700 for Clean Up Australia Day. 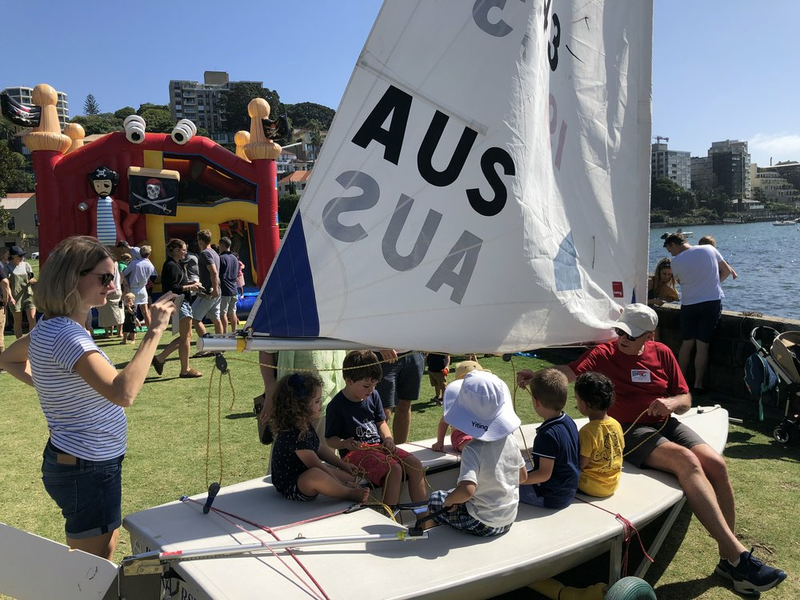 We had numerous enquiries about teaching kids to sail (which we referred to Woollahra Sailing Club) and about 8 serious enquiries about LTR and membership. Special thanks to Kirk Marcolina, who led the initiative, and Justin Davey, who worked closely with him, both spending countless hours enabling this to happen. And thanks to the NSW Government for the funding provided. It was a very successful day for the club which was perfectly aligned with our strategic goals of member engagement, community awareness, new member origination, and fundraising. Thanks again to everyone involved, this was an incredible example of volunteer teamwork and community spirit that makes our club great. Ash teaches the kids all his tricks. As a warmup to the big Community Day, we had a member’s only Family Day on Saturday after racing. A beautifully warm day and gentle breeze greeted the families and friends who came to enjoy an afternoon of fun at the club. There were perfect conditions for tandem parent / child sailing on the laser, and a plucky young teen or two who gave a red-hot solo a go. The perfect breeze allowed a rounding of Clark Island, and for those not quite ready for the Laser, RIB rides provided for some on-water fun. Back on shore the jumping castle got a good workout and the delicious BBQ, complete with gummy worms and Chupa Chup pops, went down a treat. Thanks to everyone for making the day such a success, especially to our BBQ masters Mark Gray, Peter Collie, Pat Levy and his son, Brendan, who evidently has the same incredible volunteer spirit as his dad, stepping straight onto the BBQ for an extended stint. Thanks also to Paul Adam for keeping us stocked with an unusually large supply of sausages and bread.